The theme zip file thimpress_coaching_unzipme.zip. Click on “Begin installing plugins” link. Click on the box beside “Plugin” label to select all plugins in the list, choose “Install” from the drop-down list at the top and then click “Apply”. Click on the box beside “Plugin” label to select all plugins in the list, choose “Activate” from the drop-down list at the top and then click “Apply”. Go to Appearance >> Themes >> Add New >> Upload Theme >> select file coaching-child.zip (this file’s within folder coaching\child-theme) >> Install >> Active. then try to save changes one more time to flush styles on whole site. -> Go to menu Appearance / Customize. -> Change Active theme to Coaching. Find section Import/Export then export settings. -> Change Active theme to Coaching Child. Go to section Import/Export then import the exported file. There are 2 ways to update theme: Update via Envato Toolkit or via FTP. This is the way to update theme by a plugin of envato. Do follow these steps to update by Envato Toolkit. Step 1. Download Envato WordPress Toolkit here. Step 2. Install and active the plugin in Dashboard >> Plugins >> Add new. Step 3. Get your API keys. Step 4. Dashboard >> Envato Toolkit >> input API keys (Marketplace Username & Secret API Key). Step 5. After input API keys, there will be “Themes” tab. Now you can update theme automatically. Sometimes, you may have troubles in updating by Envato Toolkit. So another way is to update via FTP. However, this way will take more time because you have to do step by step manually. Step 1. Login you Envato account. In Download tab, find Coaching theme and choose the Installable WordPress Theme (the WordPress file). Step 2. Login your server, then go to wp-content/ themes folder and backup your coaching theme folder if you want or delete it. The content in your site will not be lost but if you have modified code, the changes will be lost. You have to reapply them after updating over. Step 3. Exact new file coaching.zip you have already downloaded from Themeforest. Step 4. Drag & drop new theme folder coaching to wp-content/ theme to override the existing files. – After update theme, please go to Appearance >> Customize >> Save customize again in order to save all css. – Any customizations you have made to theme files will be lost. Please consider using child themes for modifications. There is a zip file child theme and a readme.txt about some notes about child theme included in package theme so you just need to upload child theme > active child theme for using. By clicking on the “Customize” menu under “Appearance”, you’ll be able to change all template specific settings. Please note that, after configure something in customize, you need to click blue button <<Save & Publish>> to get the changes. There are options to control Toolbar that can be used to insert widgets at the top of your page. Note that you need to Add a Widget to show Toolbar. The guideline to Add a Widget will be expressed in the Widget Section bellow. – You can choose to Show or Hide Toolbar. – Or select a Toolbar Background color. – Text Color: The text color in Drawer. – Link Color: select color for text toolbar when hover text. – Header Position: there are 2 options is Default, Overlay. – Background color: Pick a background color for the Main Menu. – Text color: Pick a Text color for the Main Menu. – Text Hover color: Pick a Text color Main Menu when hovering the mouse on it. – Font Size: Select font size for Main Menu. – Font Weight: Select font size for Main Menu. To configure for Sub Menu such as Background color, Color Border of Sub Menu, Text color, Text color hover. This option allows you to configure to see main menu in mobile. – Footer Tittle Font: Select font for Footer Tittle as you want. – Footer Text Font: Select font for Footer Text as you want. – Background Color: Select Background color for Footer. – Background Image: select background image for Footer. – Background Position: select background position for Footer. – Background Color: select background color for copyright section. – Text Color: select color for text of copyright section. – Copyright Text: allow you to input content for the tagline in your copyright section. Select a layout: choose to display your site in full width, or in a boxed zone. Each of our themes will have one major color called “Theme primary color”. The elements of the primary color are included with: Heading Background Widget; background hover color of box “Add to cart”, “Reviews”, “Pricing”, “Compare” on Single Product Page, icon color and category color… If you configure any color, it also will be applied similarly to these elements. – Button Hover Color: Color for button when hover on it. – RTL Support: Click on ” Enable/ Disable” option to choose enable or not plugin RTL. This plugin enables the text directions functionality that exist already in the original TinyMCE editor which allow writing texts in Right-to-Left directions in the same post (or page) for languages like Arabic, Persian and Hebrew. – Check on or un-check to enable or disable pre-load site. – Enable or Disable Smooth scroll. This is place to configure for Blog page. This is the place for you to select an alignment for your frontpage, which is the first display page in your site. You can choose whether or not to use the sidebar, as well as positioning it in a layout with 1 or 2 columns. – Top Image: select top image for front page. – Background Heading Color: If you do not want to use top image, you can select Background color to replace. – Heading Text Color: Select color for heading of front page. – Color Sub Heading: Select color for sub heading of front page. – Custom Title: Custom Title in Front page. – Sub Title: enter sub tittle for front page. To select an alignment for your archiver pages, which list all your posts. 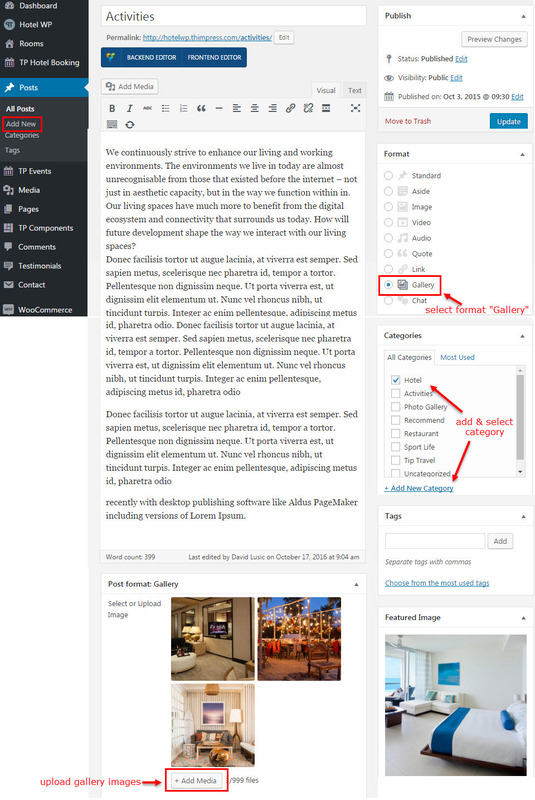 – Select Layout: You can select layout for Archive page, use sidebar or not. – Hide/ Show Breadcrumb or Tittle: Check on to Show or Hide Breadcrumb or Tittle. – Top Image: select top image for Archive page. – Color Heading: Select color for heading of Archive page. – Color Sub Heading: Select color for sub heading of Archive page. – Custom Tittle: enter name of Tittle archive page. If leave blank field, system will automatically display name of archive page. – Sub Tittle: enter sub tittle for Archive page. You could do common setting to all the posts and pages here. Other options for setting the post and page are similarly described in the Display Settings Front page. Check on social link to share posts on social network. – Background Heading: click to choose Background Color or Background Image. – Background Heading Color: select background color for heading. – Heading Text Color: select color for text heading. – Sub Heading Text Color: select color for sub heading. – Sub title: enter sub title for category product page. Here is where you can configure separately for Single Product. This is place to setting for both category product page and single product page. Check or un-check on box “Import Demo Data” to enable or disable function “Import Demo Data” and show or hide notification importing demo. Recommend un-checking on this in order to avoid from importing demo data again. Check or un-check on “Icomoon Icon” to use or don’t use icomoon icon in theme. This is place to configure for menu, drag&drop menu, add a new menu…for your site. If you want to add js code into site, you can put in this field. How to Add a Widget for one Widget Area? You also follow as above to add any widget or just Drag & Drop a Widget into a Widget Area. How to create multiple columns for a Widget Area? Go to Pages >> Add New page. Go to Setting >> Reading >> select “A static page” >> select “Posts page” is Blog page >> click “save”. Go to Appearance >> Customize >> Display >> Front Page >> configure for Blog page >> click “save”. When editing a widget, on the right of the interface always shows a Widget Styles column consisting of Attributes, Layout, Design to help you configure for this widget. Firstly, create gallery video posts. 2. Configure for portfolio page in Appearance >> Customize >> Portfolio. Please remember that if you change these settings after uploading product images you will need to regenerate your thumbnails within WordPress for the changes to be applied to your current image. To do this we recommend using the Regenerate Thumbnails plugin.